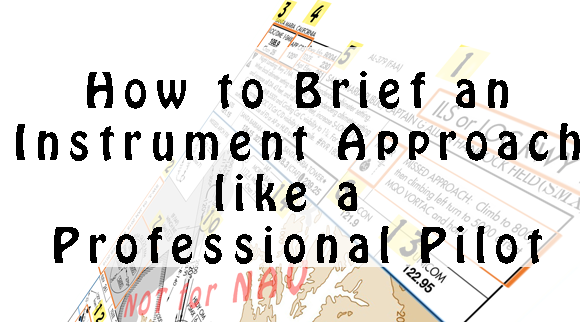 Learn to brief an instrument approach chart, from an airline pilot. Instrument approach briefings are a critical part of flying on instruments and help prevent you from making the 6pm news. During a thorough briefing we verbalize in a chronological order what we expect to happen while flying the approach. This helps us recognize the specific risks and nuances of each approach we fly. The briefing is a plan of action that keeps each flight standardized so that we can prepare for and execute instrument approaches safely and precisely each and every time we fly. The approach phase is a critical phase of flight. A thorough approach brief is a rehearsal for what will come next, yet many overlook the approach brief or emphasize non critical items. Pilots operating at the airline level brief each and every approach (VMC or IMC) in a standardized format. This is done even if it is the 6th approach of the day or the pilot’s home airport. A plan of action is always verbalized and briefed. Enroute to approach segment. Depending on your altitude you should pick up the ATIS/AWOS about 40-50nm away from your destination. Because you brief the approach in the enroute environment, you should read the approach notes, NOTAMs, aircraft performance and include them in your brief if any apply to your flight. Use the ATC frequencies as a reference; they don’t need to be included in your brief. If you have an airplane with ADS-B, you can look at the METAR and based on the wind information, estimate the runway in use. If your airplane is not equipped with ADS-B, look at your preflight weather brief to have an idea of the runway in use. Load approach in the FMS (GPS) — Regardless if it is an ILS/VOR/GPS Approach. NOTE: If you have TWO navigation radios, ALWAYS set BOTH localizer frequencies. NAVAID proving DME, if applicable. RMI 1 set to GPS. Identify Navigation Source — listen to the Morse code. Other frequencies required for the approach. Example, DME or VOR cross radials if GPS is not available. Taxi plan after you land. *Any procedures or methods used to navigate to the final approach course including procedure turns, step downs, and any circling maneuvers to be performed for circling approaches will be briefed. Any stated approach requirements and notes (i.e., radar required) will be noted. “We are doing the ILS 12 in Santa Maria. Chart Expires 1 Feb 2016. Localizer frequency, 108.9, set on both radios and Identified. Touch Down Zone Elevation TDZE is 230’. Approach light system is a MALSR, with PAPI on the right. Minimum Safe Altitude (MSA), 3300’ from the quadrant we are approaching. WINCH at or above 3300’ and Final Approach-HILDY 1886’. DME source is from the localizer frequency. We need MQO (No GPS) to identify WINCH on R-140 from MQO. If we have the approach lighting system in sight, we can descend to 330’ (100’ above TDZE). We need 1/2 sm, we have 1sm visibility. When we land, we can plan for a left turn on A5, right on A, and left at the FBO (look at the airport diagram). If we have to go missed approach, climb runway heading to 800’. Then a climbing left turn, direct Morro Bay, and hold. We are going to be doing a parallel entry. This Brief is only meant to be help you develop your own flow, when briefing an approach. However, the information mention on the brief should be the minimum you should include on your brief. Between loading the approach on the FMS(GPS), setting up the approach, and briefing it, it should take about 3 minutes. Sounds easy? It is, but it takes practice, and the mentor ship of an experience instructor. At Simtech Aviation, our instructors and simulator are perfect to help you build the skills needed to be a competent pilot, and be a confident Instrument Pilot.